The Stop Online Piracy Act is a bill currently before the U.S. Congress that would limit free speech online under the guise of protecting copyrights, which "is one of the most insidious threats to democracy in the Internet age." 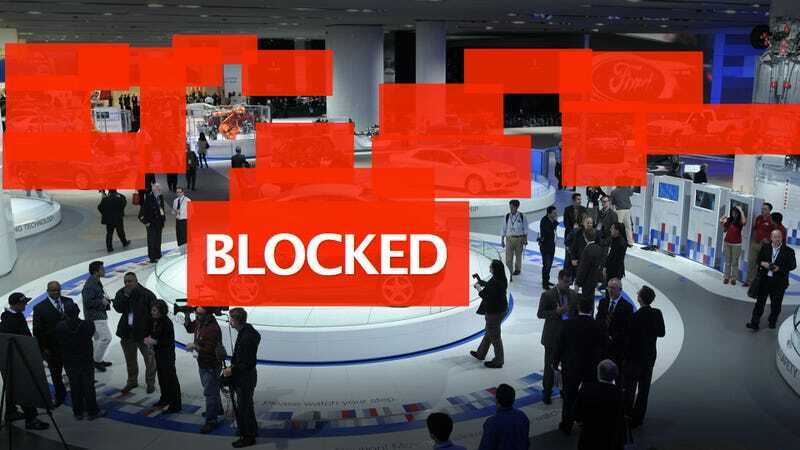 Strangely, one group supporting this legislation is the Alliance of Automobile Manufacturers, heavily represented at the Detroit Auto Show starting tomorrow. Here are the manufacturers involved in the Alliance who will be here in Detroit. UPDATE! As a trade group, the Auto Alliance represents a dozen of the large automobile manufacturers in the United States. They are the "voice for a united auto industry," which is to say the group that spent $5.4 million last year lobbying to prevent things like the enforcement of the Clean Air Act. This organization also signed on to support the Stop Internet Piracy Act. What interest would they have in doing this since auto manufacturers don't produce the TV shows, movies, or music the act is ostensibly there to protect? They do produce car images, like ones we use here at Jalopnik, although we're using them in an editorial fashion that is theoretically protected. Under the current reading of the bill, should one of our readers post a copyrighted image of a vehicle from Toyota, for instance, in the comments our site could be shut down. UPDATE Though Ford is a member of the Auto Alliance, they say as a company they do not support SOPA or SOPA-like legislation. Hopefully, more companies will come forward to disagree with this act.